Luis Almagro has accused president Nicolas Maduro’s socialist government of violating human rights and standards of democracy. 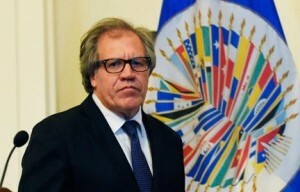 WASHINGTON DC – Secretary General of the Organization of American States (OAS) Luis Almagro wants regional governments to suspend Venezuela from the Washington-based group unless general elections are held soon to end a political impasse that he said Tuesday is destroying the country’s democracy. The request was made in a 75-page report on Venezuela’s political crisis, in which he accused President Nicolas Maduro’s socialist government of violating human rights and standards of democracy enshrined in the Inter-American Democratic Charter, to which Venezuela is a signatory. This is the second time that Almagro has asked the OAS’s 34 member states to intervene in the Venezuela crisis. The request was initially made almost a year ago, after Maduro’s government rejected a landslide loss to the opposition in legislative elections, going on to suspend a constitutionally allowed recall campaign seeking to force him out of office. Regional governments, many of them recipients of PetroCaribe subsidized Venezuelan oil, or ideologically aligned with Maduro’s leftist administration, nevertheless voted against the intervention and instead supported an attempt at dialogue between his government and the opposition. Those Vatican-sponsored talks broke down after little progress on key opposition demands, including freedom for dozens of jailed activists and a commitment to hold gubernatorial elections that should have taken place last year. “The repeated attempts at dialogue have failed and the citizens of Venezuela have lost even more faith in their government and the democratic process,” Almagro wrote. It is not clear if there is now enough support to suspend Venezuela, with a suspension requiring the support of two-thirds of OAS members. Last year’s vote to start proceedings against Caracas for violating the Inter-American Democratic Charter fell three votes short of the 23 required to be adopted, with several Caribbean countries who are recipients of Venezuelan oil siding with Maduro. Since then, however, a centre-right government has won elections in Haiti, and an anti-Maduro businessman is ahead in polls to become Ecuador’s president in the April election. Some regional governments have also adopted a tougher stance, with the Mercosur trade bloc led by Brazil and Argentina voting in December to suspend Venezuela. US President Donald Trump has also demonstrated his willingness to confront Venezuela, as evidenced by his decision last month to slap drug sanctions on Maduro’s second in command Tareck El Aissami, and his Oval Office meeting with the wife of jailed opposition leader Leopoldo Lopez. There was no immediate comment from Maduro’s government, but in the past it has accused Almagro of doing the bidding of the US government and trying to isolate Venezuela.